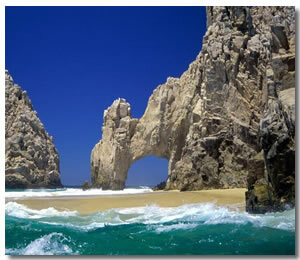 This gorgeous part of the Baja Peninsular will give you a Cabo San Lucas honeymoon to remember. You will be spoilt with Pacific Ocean views that go on forever. Lands End is also known for it's rock formations as well as stunning views. Beautiful beaches surround a place of fun, romance and beautiful Mexican desert countryside. You have the peaceful romantic side of Cabo San Lucas. There you have the Pacific Ocean, and beautiful white sands for walks along to Lover's Beach, and the Arch way. You have some of the best views in Cabo San Lucas from these vacation spots. This is one of the quietest places to stay in Cabo San Lucas. All these hotels/resorts are right on the beach, and it's a very quiet beach as well so you will get some peace there. The busy beach where the tourists go is Medano Beach which is a water taxi ride away. It's not the type of beach though where you would enjoy your honeymoon. At the same time though you're not that far away from the Cabo San Lucas nightlife. Downtown Cabo is where your Cabo San Lucas honeymoon starts to leave the relaxing, romantic stage, and enters some excitement. You have a good choice of Tequila bars, and a good choice of Cabo San Lucas restaurants. These cater for all tastes from mexican to gourmet Italian. You will have a hard time choosing where to go in your short stay here with so much variety. If you get restless relaxing for too long on your honeymoon you can always try a Cabo San Lucas Activity. These range from swimming with dolphins to ATV tours through the Mexican desert. Whatever you do during your Cabo San Lucas honeymoon your camera is a must. You will take back a lot of memories. And they're memories you will want to keep.